Don’t miss all of the FUN this summer! Funky Fish Beach Day, California Pizza Kitchen, Off the Wall, Movies and much more! Coached Football, Baseball, Kickball, Basketball, Soccer and more! Weekly Shows … Bounce Houses/Water Slides, Ziggy the Clown, Magician, puppet shows, Jammin’ Express, Crazy Hair Day, Splashtastic and many more cool events! Music, Creative Movement, Art and more! Weekly shows … Puppet Shows, Circus Clown, Ooey Gooey, Storytelling, Characters and more! 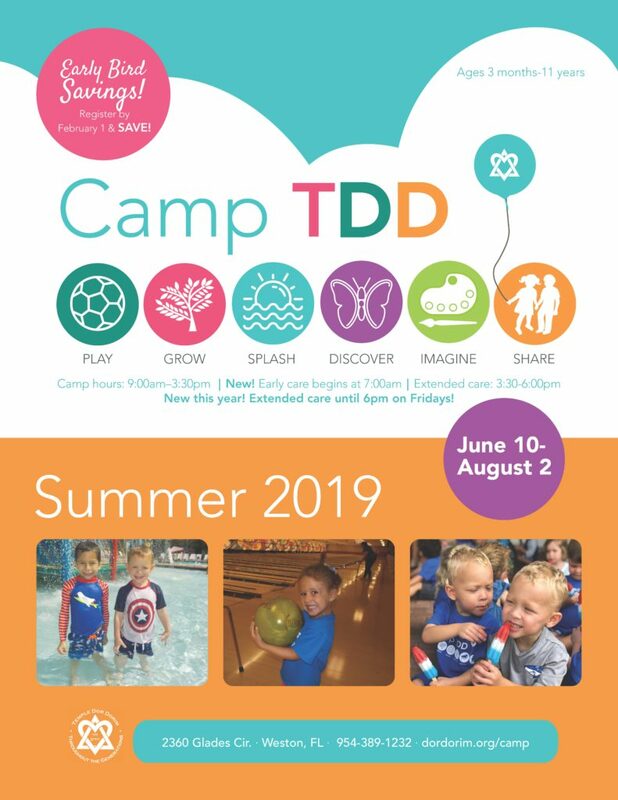 Camp TDD Facility – Our Summer Day Camp is located at 2360 Glades Circle, right off of Glades Parkway in Weston, Florida. We pride ourselves on a camp program that offers parents peace of mind in knowing their children are in a safe and secure environment. Adult educators supervise our groups, and all senior, junior and C.I.T. counselors undergo full background screenings and fingerprinting. Our Camp office is well equipped to handle any questions or concerns you may have and are there to make sure your camper’s summer is a success! Our Camp Director, Sheila Woldenberg and our Camp Administrators, will be onsite making sure all of our counselors are providing your child(ren) with the best summer experience ever! If you are interested in being part of our amazing team, complete our application and contact our office. NAEYC Accredited Staff. It is our goal at Camp TDD to provide a safe and nurturing camp experience while reuniting with old friends, making new ones and creating long and lasting memories. Your child (ren) will have a fun filled summer with many activities planned according to their age group. At Camp TDD safety is the utmost importance that is why we have trained professional teachers in every cabin. Our staff aims to build self-confidence and social skills while creating many hours of fun filled activities. We hope to see you this summer! For a personal tour of our facility and to receive admissions information please contact the Early Childhood office at 954-389-1232 or email us.